There was no getting around this fight. I had to keep the candle burning, finish the strange ritual, but I had to fight Mantipede as well. I had no idea how in the hell I would accomplish both. Lucky for me, none of these creatures seemed to care one way or the other about the candle. They were too busy getting their asses handed to them by yours truly – with a little help from ManQuail of course. I took advantage of their ignorance and shifted my feet toward the far side of the living room, hoping the cursed army would follow. Sure enough the mass of birds, bugs, reptiles and rodents surged in my direction like a lumpy, feathered tidal wave. They left my burning black candle alone. Mantipede beat his way through his colleagues, not caring whether he hurt them or not, and bore down on me like a freight train. I realized he had to be two feet long. His creepy spiked legs, attached to individual segments that looked like they were made out of steel, moved with frantic flicks, as if they had no mind controlling them and were simply cogs in a machine. Two gnarly fangs, likely grotesquely enlarged forcipules, protruded from the end of (what I assumed to be) his mouth. “Damn right we want you,” someone called out. My quail friend replied, “F#ck!” I had to hope he knew what I was talking about. But he had his hands full as well. For a quail whose strength didn’t match my own, he was doing a decent job on the attackers that managed to get in his line of fire. It helped that he had sticks of burning incense, which he held in his beak and swung around like a sword. He, too, seemed to be growing larger. He had to be about the size of a turkey at this point. Birds and large bugs flopped and fell around him. Glenn leaped to the kitchen counter, abandoning his post by the candle, and his attackers followed suit. I breathed a sigh of relief the candle was safe, at least for now. I turned to see Mantipede directly before me. A circle of rodents and birds ringed us, only none of them were trying to take me down any longer. It seemed they were all sticking around to watch, hoping this nasty, foul-mouthed centipede would be the ticket. None of them seemed to care about the fire licking the edges of the living room window, billowing thick smoke into the apartment. “Time to end this. 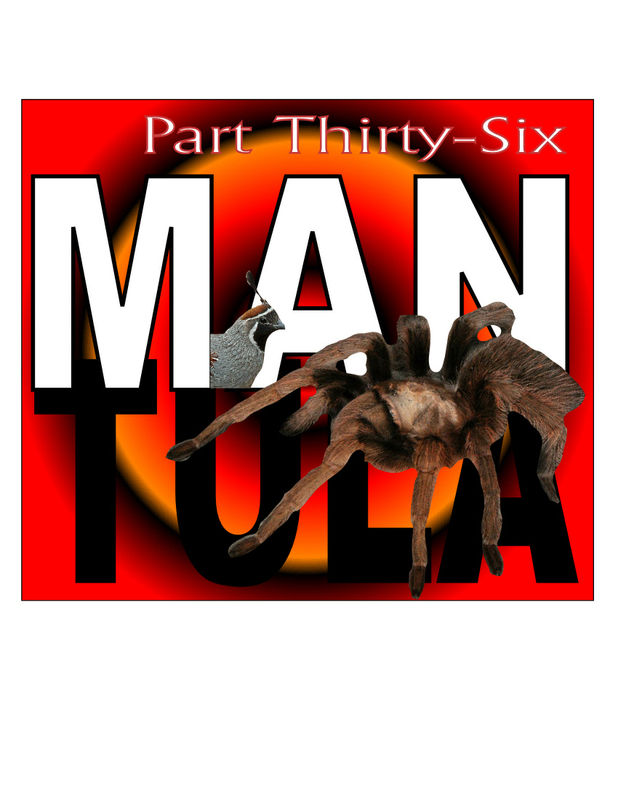 Time to get everything back to the way it was.” Mantipede’s gravelly voice sneered in my head. I dropped my leg in defeat. There was no talking to this guy. There was no talking to any of them apparently. Even cursed, even stuck in weird bodies, they were just like every other person on the planet, only interested in their own hyper-sensitive opinions. I held my ground and faced Mantipede dead on. With that, Mantipede flung himself against me. I felt the air blown from my spider body as we both flew backward into the crowd. Many of them scattered, but I found myself on top of a scrub jay and a large black butterfly of some sort. They were all growing much larger than they should be. For a split second I wondered if they would get as big as humans, but stuck in their cursed forms. Who knows how these things work? I felt a flurry of spiky jabs into my abdomen and could hear the shouting voice of my adversary as if he were right inside my head. Those cute little legs, it turns out, packed quite a wallop. I tried not to groan however, nor flinch, which I doubt I could even do in the body of a tarantula. He kept at it, but I managed to get a few of my legs under him during the attack, while the scrub jay struggled to get out from under my body, screeching frantically. 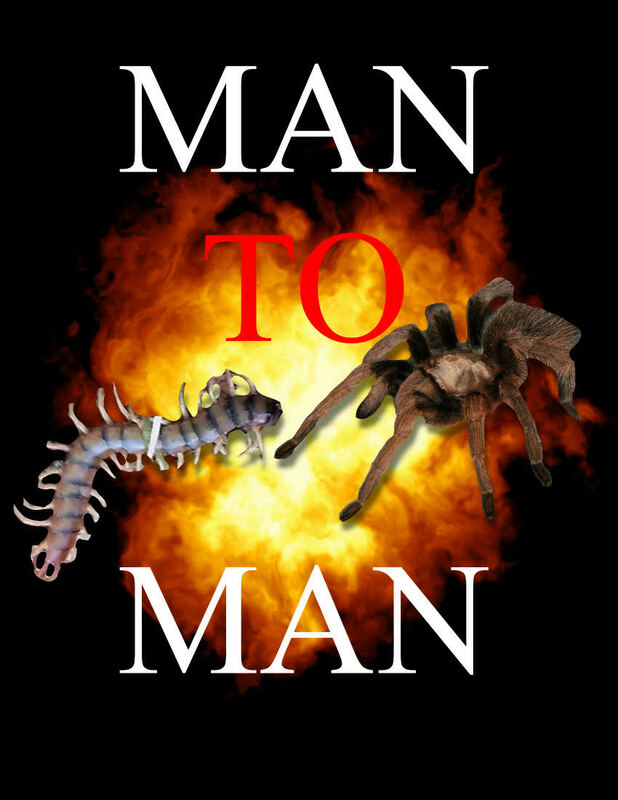 With one solid heave, I tossed Mantipede against the far wall. But I wasn’t done with him. For everything that happened to me in the last year, including the final insult, that of being forced to fight an overgrown, gross monster of a centipede, I think I had every right to let my anger have it’s way with me. So my legs flew rapid fire. I slammed him again and again against the wall, enough to crack the plaster, and had no intention of letting up. We both turned from men trapped in the hides of insects to an explosion of primal force. I remember only flashes of it. There was pain. There was anger. And there was the perfect blend of them both. It didn’t matter my crappy little apartment was likely burning around me and, forgive me for saying this; it didn’t matter whether anyone else lived or died in that moment. My son, ManQuail, Diana; none of them mattered to me at that moment. Baldy mattered, crushing Mantipede consumed me, and through my haze of red rage I hoped to do just that. Only Baldy seemed just as pissed. His screams rained hate and anger in my brain. “Kill them! Kill them all! Get them off me! Get them off!” This blind rage, measured against the length of mine, had us evenly matched, if not a little more in his favor. As terrible and angry as I felt, I carried intelligence upstairs. It even managed to seep to the fore when I didn’t want it to. Hearing Baldy’s insane tirade made me think along a more clinical tangent. I wondered about his irrational fear and questioned how that kind of a fear could affect someone of limited capacity. Having that thought seep into my active mind proved to be a big mistake. I’d no sooner had it than I felt Mantipede wrap his entire body around me. He began to squeeze. And Squeeze. And squeeze harder. I suddenly felt as though I couldn’t breathe. All of my legs were pinned under his body and no amount of strength could save me. The monster wouldn’t budge. At that point, I started seeing black spots and I began to panic. He was killing me. Right there and then, with so many creatures watching, I would die.